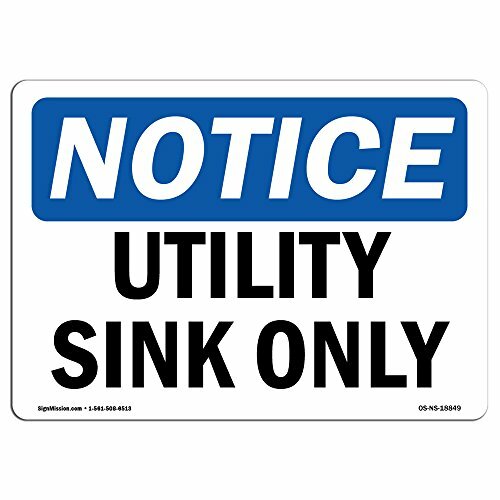 OSHA Notice Sign - Utility Sink Only | Choose from: Aluminum, Rigid Plastic Or Vinyl Label Decal | Protect Your Business, Construction Site, Warehouse & Shop Area | Made in The USA by SignMission at Wakaf Center. MPN: OS-NS-P-1218-L-18849. Hurry! Limited time offer. Offer valid only while supplies last. Make Sure You & Your Business are OSHA & ANSI Compliant.Is your business or work space 100% covered and up to code with current signage and labels? EXTREMELY DURABLE: All our OSHA safety products are made from commercial grade materials specifically rated for outdoor or indoor usage for years of maintenance free life in the harshest environments. Our signs will last as long as your business! SIZE & SPECS: 18" X 12" Rigid Plastic - Commercial grade polystyrene with (4) pre-drilled ¼" mounting holes and rounded corners. VIBRANT & VISIBLE: We use smart fonts and unrivaled inks and colors to ensure that our signs are visible inside and outside even in poor lighting and extreme weather. Our signs won't fade from the sun and are guaranteed corrosion free for life. Products can be mounted on walls, doors, fences, construction and caution areas.